You’ve heard that airline baggage handlers are gorillas that throw bags and gun cases around, but in my experience that is not the case. I peek out the plane window whenever I can and watch those guys, and for the most part they are responsible with peoples’ bags. Now, I understand that some people flying with guns have horror stories, and some of those have been posted here on the blog. But I’ve been lucky with my rifles over the last 30 years, and yes, I knock on wood. I’ve always used a top-quality hard case. 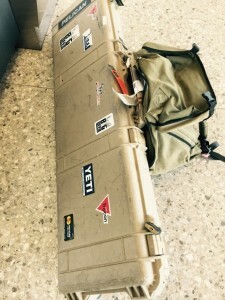 With all those miles you fly and connections, plus the last leg of a journey to and from your destination, your case (and guns and scopes inside) will be subject to a lot of thumping, rattling and shimmying in the belly of airplanes, bed of trucks, boats, etc. Don’t skimp on a hard-sided case! BEST TIP: Buy a quality hard case that will hold 2 rifles. Even if you don’t carry a back-up rifle, the case will be large enough to pack your binoculars, 2 boxes of ammo, shooting stick and some other stuff, which saves you room and weight in your other bag. Definitely buy a case with wheels that you can roll easily through the airport (all the best cases nowadays come with wheels). 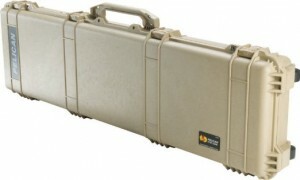 Pelican Double Rifle Travel Vault: This is one of the best hard cases I have ever used, and the one I carry now. These are the same type cases that traveling military and professional photographers use (on a typical BIG DEER TV shoot our cameramen might carry 6-8 Pelican cases). The exterior is made of polypropylene copolymer material that is fairly lightweight but thick, tough and durable. Available in black or desert tan, the latter my favorite. Inside, the open-cell core foam and solid-wall construction absorb shock to protect your guns and optics and their zero. Easy-open latches combine a C-clamp with a secondary action that works like a pry bar so they lock tight but release with just a light pull. You can latch on 4 locks. Case is 53 inches long, and can be checked as your second bag with no additional oversize fee (other than the customary second-bag fee). Empty, the case weighs 26 pounds; with two 8-pound rifles it still comes in well under the airlines’ allotted 50 pounds a bag. I am not the only one who has had good luck with this Pelican case. In more than 100 Cabela’s customer reviews, it got 5 out of 5 stars. Cost is around $240; this case will last you for many years, probably forever. SKB iSeries 5014 Double Rifle/Bow Case: This one is a no-brainer if you sometimes take guns and sometimes bows on a plane. 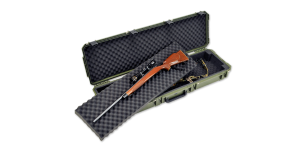 The case holds 2 bows or 2 rifles or a bow/rifle combination that you stack inside. The high-density polyurethane shell closes tightly and is rugged. It has 4 trigger-release latches with TSA-approved locks, and 4 more holes along the case for your private locks. Interior has thick foam and Velcro straps for securing bow limbs, something I have always liked in a case. This case is big enough for the biggest travel job, but still a good size to handle and roll (54 inches long and 26 pounds empty). So again, no oversize excess fee. While I have not used this particular new case, I have used several similar SKB cases with great results and cannot imagine that the iSeries 5014 is not a quality one. This case retails for $280 and comes with a limited lifetime warranty that covers up to $1,500 in damage. Green, black or tan. Once you’ve got your case, read our ultimate guide to flying with guns before you take off. This entry was posted in Big Deer TV, BigDeer, Bowhunting, Deer Guns & Loads by admin. Bookmark the permalink.